1st and2nd place painting category out of 5000 entries. State wide competition held by the Florida Association of Christian Colleges and Schools. Madisyn won 3 first place awards for these 3 pieces shown in the photo for the Marin County Fair Show. She can be featured as the recipient of the Women Supporting the Arts scholarship award for the last 2 years. Her work will be featured and she will be painting live in the Home and Garden Show this weekend March 6-8 at Martin County Fairgrounds. She will also be showing for the first time as an emerging artist at ArtsFest on March 28-29 in the community tent with professional artists from our community. Kimberly Locke, her parents and school teachers are invited to participate in the 5th World Children's Festival this July 4th weekend at The National Mall in Washington, D.C. Kimberly's artwork will be also be showcased at the 2016 Summer Olympics in Brazil as well as online. "I call this painting, "Sailing Towards the Finish Line". It is a self-portrait representing me working towards my goal of making it into the Olympics in 2024, which I hope to do with my identical twin sister, Caroline. I painted this painting of me sailing in my "Opti", which is short for Optimist Dinghy. Optis are the largest class of racing sailboats in the world and are for kids between the ages of 8 and 15. Sometimes we have more than 300 kids competing in a regatta! After I heard about the Arts Olympiad, I was very excited because I consider myself both an artist and an athlete. I originally painted this painting in acrylics and then created a digital art piece from my original work to add effects to make it more dynamic. Most of my life I have sailed. I have always wanted to be in a big event with my sailing. I think it would be amazing to go to the Olympics. I think the Olympics should include art as well as sports because art involves the brain while sport involves the body and both together make a complete person. First launched in 1999 as the "Olympics" of children's imagination and co-creation, the WCF has grown into the world's premier children's celebration and is now a permanent quadrennial event in our nation's capital. The WCF advances a grassroots movement for children's creative and empathic development sparked some twenty years ago by the International Child Art Foundationas the building block for universal prosperity and peace. All students participating will receive a certificate of excellence. This show simply amazed our community. Every single painting is worthy of an award! Kimberly Locke and her family were invited to participate in the 5th World Children's Festival this July 4th weekend at The National Mall in Washington, D.C. What an amazing experience for Kimberly and Caroline! At the 5th Arts Olympiad Awards Banquet they made friends and pen pals and traded swag with kids from Japan, Uganda, Zimbabwe, China, Malaysia, Australia, Liberia, Kentucky, New Zealand, Sudan, Germany, Turkey, Azerbiajan, Balarus, Romania, Russia Indonesia and California. Too cool! After she and her family arrived home from the Art Olympiad in Washington DC they opened the mail and found out that "Sailing to the Finish Line" has also been chosen as one of the "Top Ten" entries in North America in the Celebrating Art Contest ! Besides going on tour to Sweden, Malasia and the Olympics in Brazil, her painting will be published in an art book and may even be featured on the cover. Kimberly is thrilled because she won a gift certificate to purchase art supplies. So happy for her. Posters will be displayed at Martin County restaurants, local businesses and at the “plant sale” at the Home & Garden Show March 5-6. Their original art will each be displayed at at one of the gardens on the Secret Gardens Tour. 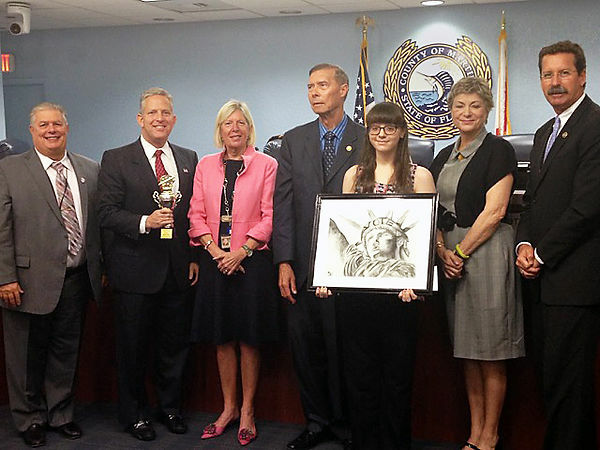 2015-2016 Florida PTA Reflections "Let Your Imagination Fly"
Several of our artists were featured in the 2017 Never Forget Tribute Youth Art Exhibition & Contest.